My Trusty Magnet | Be Nice. Trust in the Lord with all your heart and He will direct your paths. I have relied on this phrase for years, thanks to my First Communion back in second grade. 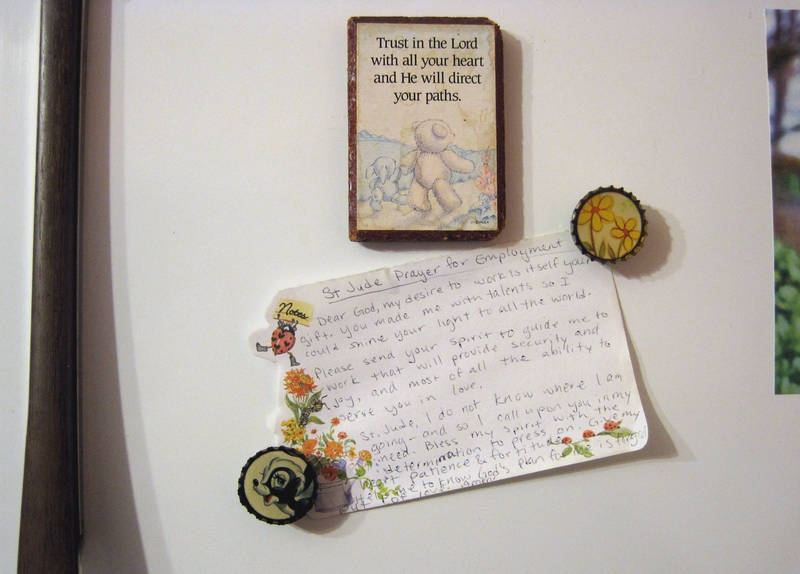 As a gift I received a magnet with a laminated image of a bear and bunny walking hand in hand down a path pasted atop a fibrous wooden backing. My mom adopted it through the divorce and single motherhood – its rightful place was in the top-most corner on the refrigerator in every house we lived. I didn’t reclaim it until I moved to New York, and luckily its parting from my mother’s troubled gaze was relieved by the overall happiness in her life. Though I don’t practice a religion these days, I feel comforted by my childhood prayers…. Any time I cannot find my keys: “Saint Anthony, Saint Anthony, Something is lost and cannot be found, can you please help me as I look around?” Any time I feel out of control and frustrated: “God, grant me the serenity….” And when I didn’t have a good job (and, for a while, any job) after graduating at the height of the recession, I read the St. Jude prayer for employment pinned to my refrigerator almost every day. These prayers resonate with hope and trust no matter one’s religious convictions. Whether I believed in a higher power or myself – though it was most certainly a combination of both – I knew whatever happened would “be.” I would make the most out of any result. And truly… it would make the most out of me too. In difficult times, knowing even this, doubt and fear lingered on my sunny horizons daily – with anger not far behind. In 2009 my husband and I had trouble finding any jobs at all after graduation, let alone ones in our field. After a few months, we happily took positions in data entry and stayed there for around two years while we searched for something better. For two years I pivoted between gratitude and aggravation. I was so lucky to have a job that paid my bills and gave me insurance in the recession, but it was so much less than what I had hoped for. We had worked for years to be teachers, and here we were watching those jobs evaporate in a declining economy. I thought of people who at this point would opt for a more “stable” career like nursing and return to school. I contemplated ways to make myself more employable. I wondered what would happen to me if I never made it out of my current position…. I felt increasingly hopeless and desperate. Working through these emotions I came to understand that perhaps my dreams needed to become more flexible. Yes, I had dreamed of being a teacher. But what if something greater were ahead for me? Something I couldn’t imagine? Through the fog of disappointment and apprehension, I placed my trust in God, the universe, and myself that it would work out. I would continue to do things that gave me joy, I would widen my expectations to make room for surprises and new possibilities, and above all I would stay positive and grateful while acknowledging the painful feelings too. So I curated exhibitions, I showed my work, I took on more responsibility at my current position, I began to develop a fitness habit, I grew within my friendships and marriage. One day unexpectedly my husband applied for a production job in a warehouse. He had to get out of data entry – it was driving him nuts. As long as this job was comparable in pay it was good enough, he said, though he had hopes it would turn into more. I was nervous but trusted his judgment, and in just a year and a half he transferred from a production worker to a researcher. In 2009, neither of us could have imagined my artist husband would be a scientific researcher in just three short years. But God works in mysterious ways, and my husband has never been happier. He loves his work. He loves his company and his colleagues. He is challenged and gratified daily by his experiences and discoveries. With his position came further developments we had not expected. We were now permanently rooted in upstate New York. No more national job searches! We were here. We could settle down! I envied his happiness and wanted a little bit for myself. 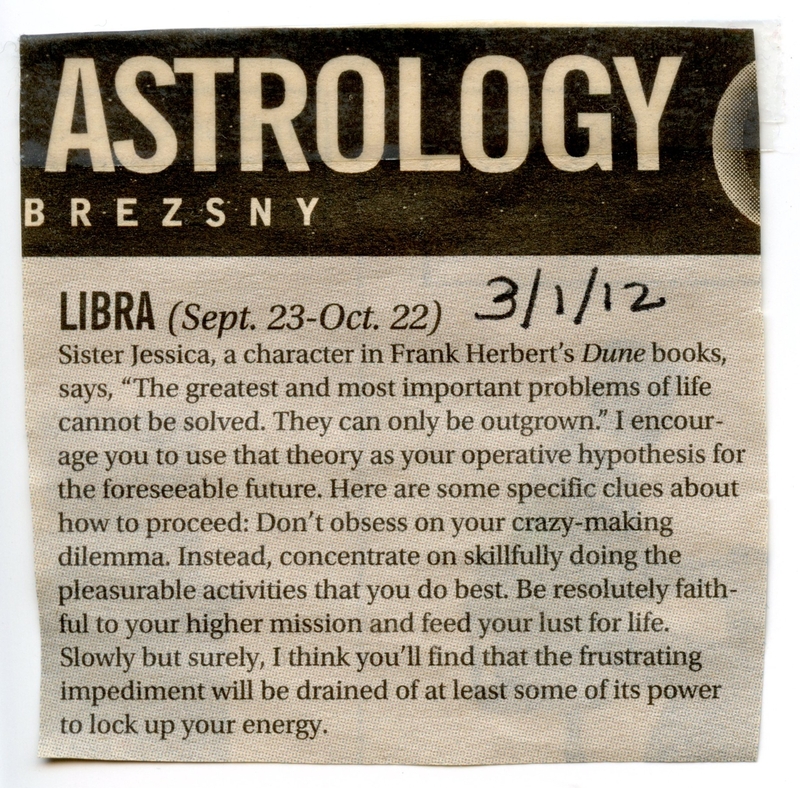 In March of 2012 one sentence in my weekly horoscope jumped out at me…. The greatest and most important problems of life cannot be solved. They can only be outgrown. Suddenly a sense of understanding came over me as I continued to read. It was what I knew deep inside, but somehow seeing it there in print bound itself to my psyche in a way I hadn’t been able to manage previously. Just keep doing what I love. Keep living a life of purpose and passion. Don’t focus on what isn’t working. Concentrate on what is working, and go from there. The Metroland horoscope section from March 2012, cut out and taped to my wall for a year now. I taped its message to my wall, and it guided me as I searched for better jobs and continued to do the things that brought me joy. As if it were a self-fulfilling prophecy, in less than a month I found a position with a locally owned company that gave me butterflies in my belly. Could this be real?! Out of nowhere I had walked into a company which values its workers and shows it through compensation, benefits, and other forms of generosity. My work environment is positive, supportive, and happy. My bosses smile more than I have ever seen any managers smile; their level of professionalism and dedication is admirable and inspiring. They welcome input (and act on it)! It was everything I needed after my last job, and it was within a few miles of Jake’s workplace and on the bus line near our home! I still sit in wonderment at how God provided for us all these years. I look back and see the difficulty, but I value more the perseverance and the synchronicity which occurred to bring us to this point in our lives. I can finally breathe. I can finally relax. I find myself now in a place of infinite possibility. We are here. We are rooted. We are somewhere I couldn’t have anticipated. I wonder… what will my next dream be? To be honest I feel slightly adrift and aimless these days, but also reassured and calm. I did not expect to be here. This is not what I planned. In so many ways it is better than I had imagined. And now, I need to formulate dreams for my next possible future. I ask myself, where am I headed? What is my newest challenge? And how will I be surprised in the process of finding my future? By living and being my best version of myself amidst the angst of uncertainty and disappointed hopes, I knew my actions would steer me onto the most optimal path toward a resolution to my problem. I might not have known which result my path would yield, but whatever endpoint found me had to be the right one because I had done my best in getting there. By leaving our futures open to possibility, my husband and I found ourselves in a place better than we could have dreamed. I can only hope this is the beginning of a kind of happiness I have never known. Is there even more happiness to come, more joy than I can fathom? What is possible? This entry was posted in Perspectives on Be Nice. and tagged serenity prayer, synchronicity, wherever you go there you are by Jen. Bookmark the permalink. I LOVE this… such excellent advice. As someone who tends to spiral down into negativity, this is such a beautiful reminder that when we embrace what is good and give thanks for our blessings, we can find happiness every day, no matter what others trouble may be swirling around in your life. Focusing on the problems gives them more power and makes their weight feel so much more unbearable. I do this often, and I am so grateful for your gentle reminder that we can get through anything if we let the good outshine the bad.